Steve Jobs had a life-long fixation on LSD, and often ended up asking potential Apple employees during interviews how many times they had dropped acid to throw them off guard. Steve Jobs personally considered doing LSD to be one of the formative experiences in his life, and was insistent that others should do it, too. With such a famous advocate working for free, it’s not a surprise that the man who invented LSD eventually contacted Steve Jobs. What is surprising, though, is how long he waited to get in touch… until he was 101 years old! The last line refers to Hofmann’s book, My Problem Child, which describes his discovery of LSD and how it was eventually misused, vilified and outlawed thanks to its role in the 1960s counterculture movement. Unfortunately, there’s no word if Steve Jobs ever responded to Hofmann, and the LSD inventor died the next year at the ripe old age of 102. Who knows? 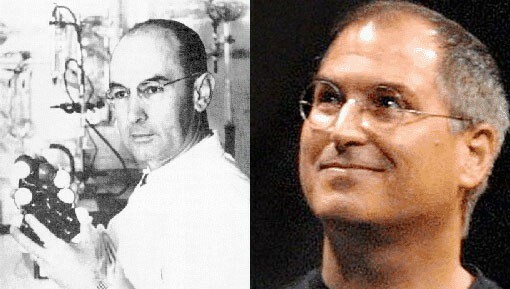 Working together, Steve Jobs and Albert Hofmann might have finally managed to reverse LSD’s social stigma and maybe even make popping a few tabs mandatory for employment at Apple.